In this blog we are going to look at hydration and the facts around ‘water’…I am using water in inverted comma’s as again this can be misleading. In the scientific community, they talk about ‘water’ they are often talking about nutrient water, which we can be sourced from both the food we eat and the fluids we drink. This also includes plain old tap water! How many glasses of water should we drink each day? What about my cup of tea, does that count to my daily intake? Why is it so important that I drink all this ‘water’? May be some questions that you have thought about, or may not! How Many Glasses Water a Day? Not a straightforward answer, I’m afraid. This is very much dependent on a number of factors and can vary from day-to-day. Factors that can effect an individual’s need for water are age, gender, activity levels and the weather outside. To help maintain a balance regular intakes of ‘water’ are needed. The European Food Safety Authority (EFSA) recommends an intake of 2.5 litres of water for men and 2.0 litres of water for women per day. 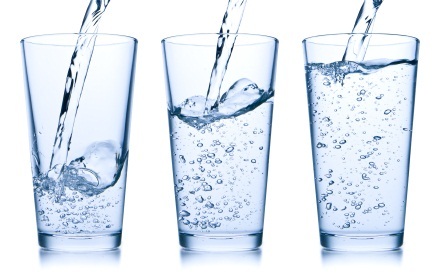 Of this, 70-80% of the daily water intake should come from drinks, and the remaining 20-30% from food. Cucumbers (96.7% water content), try adding some to salads or sliced up with some hummus. Iceberg lettuce (95.6% water content) add it to that cucumber! Or even on a sandwich. Celery (95.4% water content) and it can also help with heartburn and acid reflux. For a little spicy-sweet flavour, add some radishes (95.3% water content). Tomatoes (94.5% water content) not only add flavour and colour to a salad or sandwich but cherry tomatoes are great as a snack. Wimbledon isn’t too far away, so that means that strawberries (91.0% water content) are here too! Broccoli, cauliflower, kale and cabbage have a great nutritional profile but also have a high amount of sulforaphane, which helps to boost the body’s protective enzymes. So what happens if we are not able to maintain our water balance? This is a very sensitive system and even as little as 1% loss of body weight (due to fluid loss) will result in your body becoming dehydrated. In normal daily activities (excluding sweating), an adult would be expected to see a change of around 4% of their body weight due to a daily turnover of water. Once we feel thirsty, this is our body’s indicator that we are becoming/are dehydration. Another indicator is our urine. As a rule of thumb, the closer to a straw colour – you are hydrated. The darker the colour – you need to drink more fluids. Being more physically active increases our rate of sweating which can affect our water balance. So bring a bottle of water with you to your next physio session! An additional 2-3 cups of fluid would sufficiently rehydrate you. We are also told to drink plenty of water when we are ill, especially if we are suffering from gastroenteritis, where fluid if lost through persistent vomiting and diarrhoea. Some medical conditions such as diabetes, thyroid disorder or kidney disease may mean you are at a higher risk for dehydration. This may make you more prone to urinary tract infections (UTI’s), drinking more fluids will help to prevent infections. In warmer/dry environments, we are at a greater risk of dehydration. This not only includes the blue sunny skies of Manchester!! But also centrally heated homes. Drinks that contain caffeine (coffee and tea) act as a diuretic. This stimulates the kidneys to produce more urine…hence; you need to use the toilet more! Also, alcohol has the same effect, and that headache the next day is your bodies way of telling you that it’s dehydrated and needs some fluids. How do you find ways of keeping hydrating?